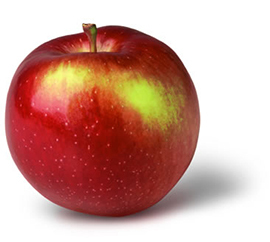 The Jersey Mac apple is medium sized red apple with yellow/green splashes. Flesh is crisp and juicy with a tart flavor. 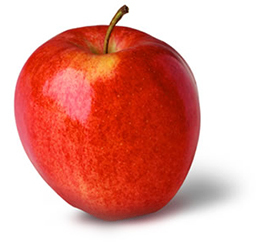 It is an excellent snacking apple, that is very similar to its cousin the McIntosh. Tender flesh cooks quickly so add a thickener if making a pie. *Image and information courtesy of New York Apple Association. Can't wait for your favorite apples in the early fall? 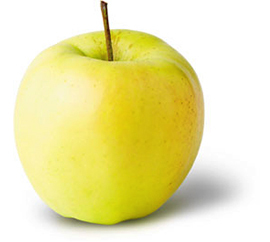 The early ripening Ginger Gold will satisfy your need for a great snacking apple. Check them out early in the season when this special new variety is readily available! Ginger Gold is very slow to turn brown so it's an excellent choice for any fresh cut apple use. If you like tart apples, sink your teeth into a Paula Red. 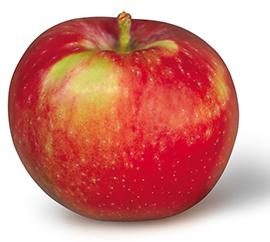 It's one of our earliest varieties and the first taste of fall for many apple lovers. Check them out now because Paula Reds are only available for a short time! 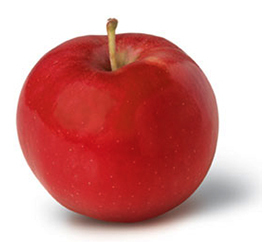 Another apple made for kids is the Gala, a new variety developed in New Zealand. 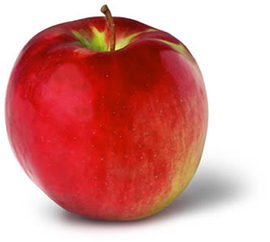 It's got the mild flavor that "picky eaters" prefer and a striking bright yellow-red color that attracts the eye! Galas' size, mellow flavor and thin skin make them a perfect choice for kids. Nothing evokes Fall better than the aromatic fragrance of McIntosh apples. 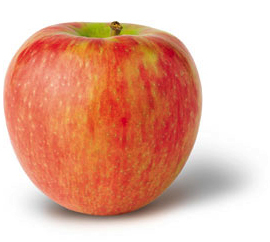 People have enjoyed this apple since 1811 when John McIntosh discovered the first seedling. McIntosh apples grow particularly well in Connecticut's cool climate! 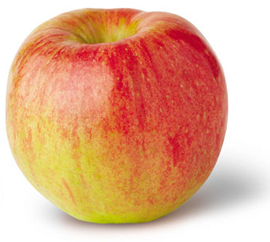 Honeycrisp apples are honey sweet (with a touch of tart) and amazingly crisp, some say "explosively crisp." It's easy to see why this new variety continues to grow in popularity since its 1991 introduction in Minnesota. Imagine a fragrant fresh fruit cup with beautiful snow white apples. Wonderful for kabobs, fruit plates and garnishes because they don't turn brown quickly when cut. Want a perfect no-fat dessert that will satisfy your sweet tooth? 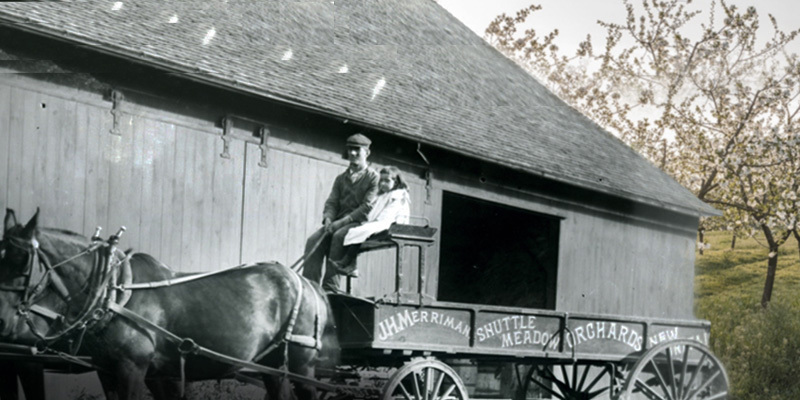 Macoun was developed at the New York State Agricultural Experiment Station in Geneva in 1932. It's named for a famous Canadian fruit breeder. 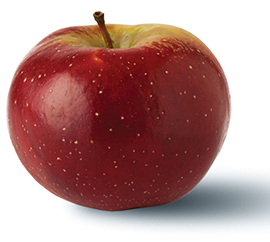 With the popular Red Delicious and McIntosh for parents, Empire apples were destined to be a hit. It's a sweet-tart combination that's great for everything. Small Empires are great for school lunches. 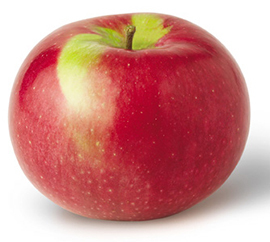 The Cameo is a bright red striped apple with a creamy orange color, that's firm and crisp. 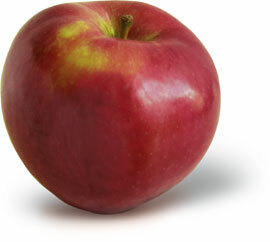 It has a thin skin with a sweet tart flavor, and makes a great fresh eating apple. 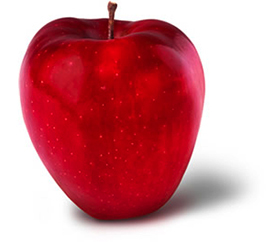 If you haven't tried Red Delicious apples, then you are missing out. These popular mildly sweet apples are grown across the country! Red Delicious apples are the favored choice for holiday centerpieces and wreaths. Firm and crisp with a very sweet flavor. great for making pies and sauce. This honey sweet apple is a special treat all on its own. 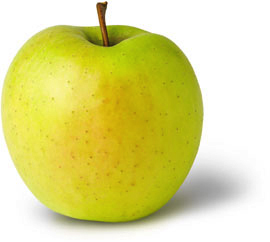 You can cut down the sugar in pies and sauces made from Golden Delicious apples. It's one of the most satisfying snacks around! 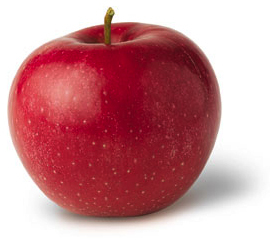 The original name for this exceptional apple was Mutsu, reflecting its Japanese heritage. It was renamed Crispin in the late 1960s. Try Crispins for roasting whole apples or thick slices. 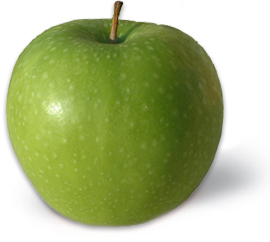 Granny Smith pre-dates the modern approach to apple development and marketing. Like all the best old varieties it has a bizarre history, being discovered in Austrialia in the 1860s as a seedling growing in the remains of a rubbish tip. It is an uncompromising crisp hard apple with a very sharp taste. Good for cooking and eating. 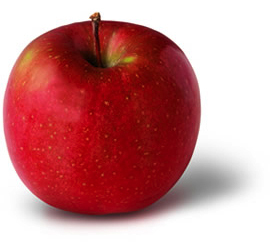 The Jonamac apple is a cross between a Jonathan and McIntosh. The eating quality combines the rich flavor of McIntosh with some of the spiciness of Jonathan. The texture or crispness tends to be similar to McIntosh but harder. Excellent for cooking, sauces or eating. An old favorite home and market apple in Maine. Large crimson coated fruit over green. Flesh is yellow, crisp, juicy and makes a wonderful, spicy, aromatic cider. Is an excellent dessert apple and keeps 'till March in cold storage. Crisp, juicy and spicy flavor. Savor the old-fashioned goodness of baked apples, especially Idareds, which hold their shape perfectly and look beautiful on the table. 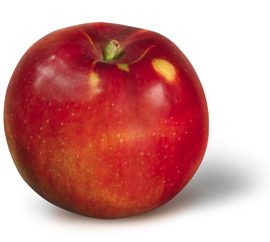 This is the apple that many people just know as 'the russet apple'. It has the rustic looking rough golden brown skin with a sandpaper like finish. It is sweet with a distinctive dry nutty flavour and texture. Works well with savoury salads and partners well with cheese. Perfect fried apple slices sitting next to a pork chop are probably Red Romes. These superb cooking apples retain their shape beautifully as well as their tart flavor. 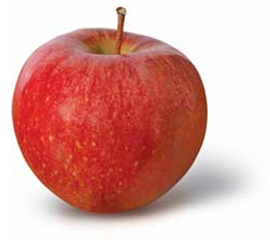 Combine Red Romes with a sweet apple such as Golden Delicious for tasty applesauce. Wow! What a great snacking apple! 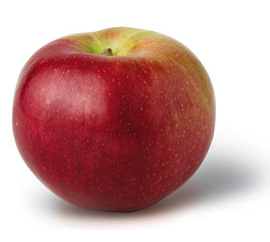 Fuji apples have it all--super sweet, super juicy and super crisp. This Japanese apple has American parents, Red Delicious and Ralls Janet, an antique apple that goes back to Thomas Jefferson in 1793. Because they are characteristically known for the red ring around the pit, they are most widely used for canning and freezing, but are excellent for eating and cooking also. 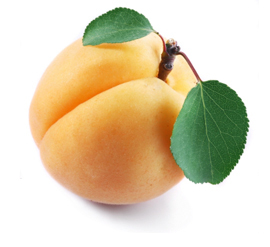 *Image represents a yellow flesh peach, however it may not be of this specific variety. A yellow-fleshed peach. 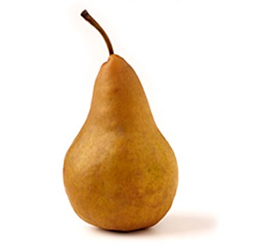 Large, firm freestone fruit. Juicy with a bit of a tart flavor. A yellow-fleshed peach. 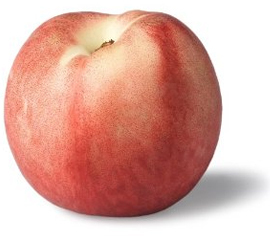 Medium to large peach with golden skin overlaid with red; firm, yellow flesh is juicy and resists browning. Yellowish red skin with a bit of a tart flavor. Large, yellow-fleshed peaches are super sweet and juicy. A yellow-fleshed peach. Large, early and delicious. 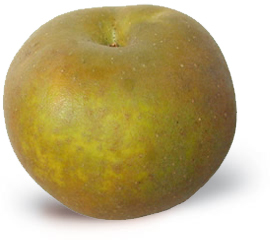 This semi-freestone peach features yellow skin with a red blush. Early-bearing, the tree produces clouds of blooms in spring followed by loads of juicy, medium-large peaches. Yellowish red skin with a juicy sweet flavor. A semi-clingstone means that when the peach is very ripe the seed will separate from the flesh easily. A yellow-fleshed peach. Yellowish red skin with a juicy sweet flavor. 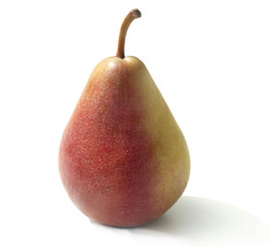 Large, round, yellow fruit covered with a red blush on the outside; firm, yellow, freestone flesh on the inside. Flesh is slow to brown, so it's good for salads. Also freezes well. 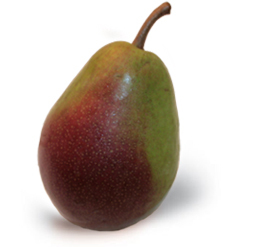 Medium fruit with brilliant red over yellow skin; yellow flesh is juicy, sweet, and fine grained. A yellow-fleshed peach. Yellowish red skin with a bit of a tart flavor. A white-fleshed peach with wonderful aromatic flavor. Medium to large in size, freestone. The flesh is soft. It doesn't keep well in the refrigerator, and it is probably too soft for canning, but eaten soon after picking, it provides an unforgetable flavor experience. A white-fleshed peach. Redish-white skin with a juicy flavor. 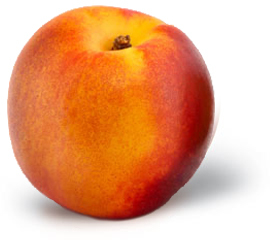 *Image represents a white flesh peach, however it may not be of this specific variety. These medium to large peaches are red on the outside with a creamy white undertone. A white-fleshed peach. Reddish-white skin with a juicy flavor. Medium to large. The skin is yellowish to green and sun-laterally washed-out red. Medium to large sized, smooth and waxy. 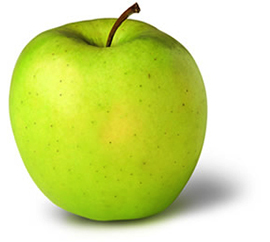 Green skin turns yellow as it ripens. A Self-fertile vigorous grower. White sweet flesh & give off a sweet aroma. Dark green, sometimes with reddish tint. Does not change color when ripe. 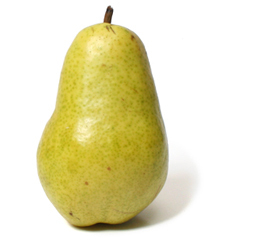 Very small but very sweet pear; perfect for children's snacks. Medium sized and bottle shaped with a regular cinnamon rost. The flesh is melting and close grained. The flesh discolours to a brownish shade. Juicy & sweet with a spicy, pleasant flavor. 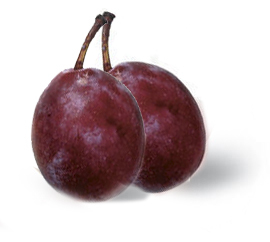 Varies in color from red to purple and can be eaten straight from the tree. Smaller and less plump than dessert plums. The honey-sweet, dense flesh of a prune plum is much better for drying than the rounder, plumper plum we usually eat out of hand. Small, golden orange fruits, with velvety skin and flesh. Not too juicy but definitely smooth and sweet. 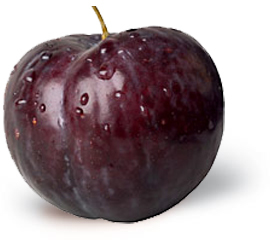 Some describe their flavor as almost musky, with a faint tartness that lies somewhere between a peach and a plum. The fruit we call nectarines is virtually identical to the fruit we call peaches, except for one noticeable feature. 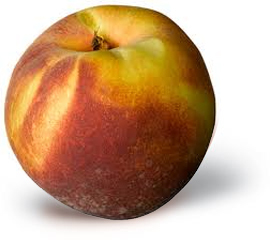 The skin of most peaches contains fuzz, while the skin of nectarines is smooth. Some consider nectarines to be more flavorful than peaches, and much easier to eat. They do have a spicier quality than peaches, and the flesh is generally firmer. 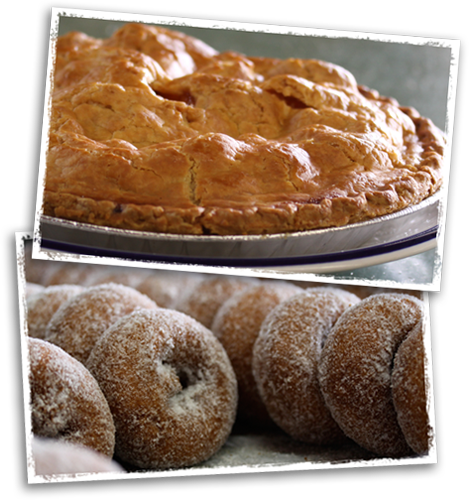 Our farm bakery offers a wide variety of fresh baked pies. Each ten-inch pie is piled high with the finest fruits and toped with a golden, flaky crust. Our apple cider donuts are worth the trip! Choose from our original recipe, or our cinnamon-dusted apple fritter donuts. We also feature our homemade apple sour cream coffee cake and a delicious assortment of farm baked cookies. We also feature our homemade apple sour cream coffee cake, apple dumplings, and a delicious assortment of locally baked breads and cookies. © Rogers Orchards. All rights reserved.